The results are in from Sicily Web Fest‘s Award ceremony and we are over-the-moon to announce that our brilliantly talented Shaun Herbertson has won us the Best Cinematography Award!!! Huge congratulations Shaun for this well-deserved win!! We were up against some impressive work in this category from all around the world and are just so thrilled with this accolade!! So thrilled for you Shaun!! Being able to achieve 13 different cinematography looks in one series is no mean feat and you so deserve this accolade!! 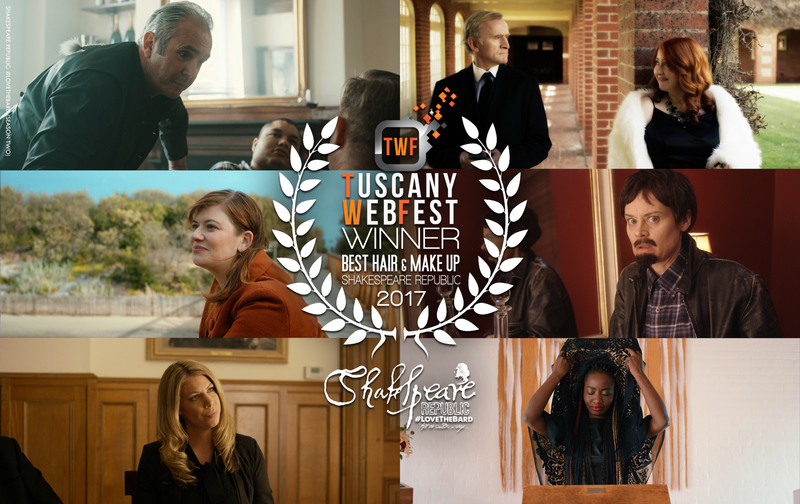 We are also absolutely delighted to announce that Shakespeare Republic has won Best Hair & Make Up at Tuscany Web Fest! We are so thrilled that our hardworking and hugely talented Make Up & Hair Team have received this accolade for all their wonderful work on the series! Congratulations to Jo Fletcher, Taryn Gionis, Joel Gionis, Paulie King and Armanda Pozzetto for this recognition for your amazing work doing everything from turning Nadine into a man and Fletch into a silver fox (Jo) to creating a slightly worn around the edges 1950’s movie star look for Sally, to ensuring that Phoebe’s hair didn’t move and yet looked completely natural in 50km gale force winds, to making Michala look like she was wearing no makeup at all, to dealing with Dean’s laptop-to-the-head incident that left a deep mark on his forehead (that you would never know about on camera because of the make up) (Taryn & Joel) to giving Wahibe a House of Cards makeover, to making an entire boardroom of 11 people look slightly pallid, yet still so pretty (Paulie) to making Falon the picture of innocence (Armanda) and so much more. Special shout out to Jamie Hannah, who took care of the camouflage make up for Billy’s episode for all the cast and did such an excellent job as well. We are so lucky to work with the talented professionals we do and we are so delighted that such a dedicated, committed and brilliant department has been acknowledged with this award for their work. Huge thank you to the Tuscany Web Fest Jury for this award and to the organisers for selecting us as one of the Golden Tickets from Austin Web Fest earlier this year, therefore inviting us to participate in Tuscany. We are very grateful for the love shown to the series! Viva l’Italia! And finally, we are truly delighted to share with you all that Shakespeare Republic: #LoveTheBard (Season Two) has been officially selected for the 2017 Minnesota WebFest!! Huge thanks to George and the MNWF Jury and the whole team at MNWF for including us in their line-up! Congrats to the whole Republic team and roll on September 30th! Posted On 03/08/2017 in Project Updates, Screenings & Festivals with 0 Comments.Tagged: awards, minnesota webfest, official selections, sicily webfest, tuscany webfest.